Used together with sand or rubber aggregate and 1110 topcoat. 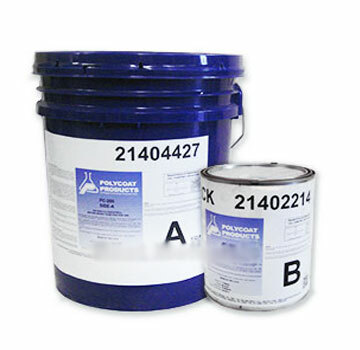 PC-260 is a two component, fast setting, fast curing, solvent free, flexible, high performance, and high solids polyurethane elastomeric coating that can be applied to suitably prepared interior or exterior concrete, plywood and metal surfaces. Due to its fast gel time, PC-260 is suitable for applications in temperatures as low as 20°F (-6°C). It may be applied in a single or multiple applications. PC-260 is also relatively insensitive to moisture and temperature allowing applications in varied temperatures and humidity. POLYGLAZE 400SC WATERPROOFING TOP COAT. 100 VOC, MEETS SCAQMD. PRE-TINTED DOLPHIN GREY COLOR. 2-PART KIT. 1-GALLON TOTAL. PRICE/KIT. Rubber Granules, #14/30, Off-White Color, 1-Lb. Super Seal Tape. High-Strength Instant-Bond Seam Reinforcement Tape. Spun-bond polyester with acrylic adhesive. White Color, 9 mils thick, 4-inch Wide x 60 Yard Roll (180 ft). Price/Roll.